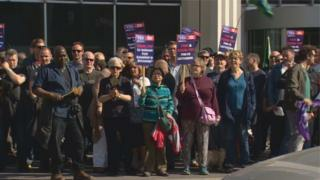 Colleges face disruption as lecturers walk out in this year's third one-day strike over pay. Members of the Educational Institute of Scotland - Further Education Lecturers' Association (EIS-FELA) will strike on Wednesday. Unions are demanding a "fair cost of living pay rise", saying the offer from employers is too low and would affect working conditions. Employers have accused lecturers of "gambling with students' futures". This latest action follows 24-hour strikes in January and February and is the third lot of industrial action by the unions in four years. EIS-FELA is seeking a pay increase in line with public sector pay policy. They have rejected a 2% increase offer over three years, and accused employers' association Colleges Scotland of seeking to tear-up existing commitments on lecturers' working conditions. Lecturers warned of possible further action, including a boycott of college results systems after talks aimed at averting the latest strikes broke down without a resolution. Details of the disruption to students will vary from college to college. EIS general secretary Larry Flanagan said: "It is disappointing that Colleges Scotland failed to accept the EIS offer to suspend strike action earlier this week. "EIS-FELA put a straightforward proposition to them which didn't include additional money but which would have allowed negotiations to continue. "Colleges Scotland rejected this and therefore the programme of industrial action will continue with today's strike, with a strong possibility of escalating action to follow." Colleges Scotland said lecturers in Scotland were "by far the best paid across the UK" and it was disappointed EIS-FELA had turned down six improved pay offers. John Gribben, director of employment, said: "The EIS-FELA is balloting their members to escalate short of strike action and has vowed to withhold assessment results from colleges, which would prevent students from graduating and progressing to other college or university courses. "This is a gamble by the EIS-FELA, designed to get the Scottish government to intervene as they calculate that will get them more money, but they are recklessly gambling with students' futures. "The Scottish government has made it clear that there is no more money for lecturers' pay and colleges have to find this additional £12.6m pay deal on offer by making cuts. "If there were any more money available, our priorities would be for additional investment in enhancing students' experiences and on further improving college campuses, as £65.8m is already being spent over three years on lecturers' pay and conditions."